Fiscal cliff: It's not a cliff. Niagara Falls, an actual cliff. 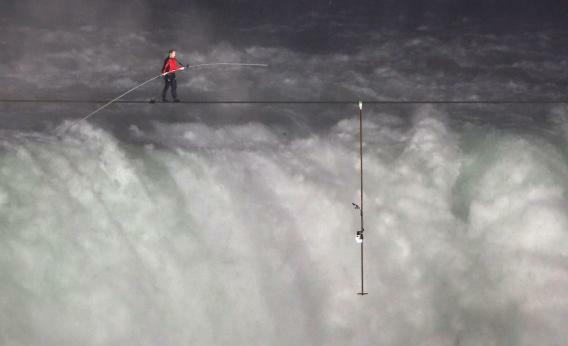 The “fiscal cliff” isn’t like this. Metaphors are dangerous, and nothing illustrates that better than the concept of a “fiscal cliff” and worry about going over it. Rather, it’s a set of policy changes—mostly tax hikes plus some steep spending cuts—that if they were all locked into place would constitute a significant drag on economic growth over the course of a year. But if the Bush tax cuts fully expire on a Tuesday morning it’s not as if some catastrophe strikes on Wednesday where suddenly middle class families have no money. It’s true that if the new higher rates were to be locked in, then the medium-term drag on middle class take home pay would delay the deleveraging cycle and damage the recovery. But to resolve that, all you need to do is introduce a new package of middle class tax cuts on Wednesday afternoon, have congress pass it on Thursday, and then the president signs it on Friday. The fact that taxes were higher for three days—or even three weeks—is simply not that consequential. Obviously to the extent that higher middle class taxes is bad, one day of them is worse than zero days and three days is worse than one day. But it’s a deeply banal situation. There’s no particularly large virtue to “averting” the fiscal cliff on Day N-3 versus “going over the fiscal cliff” and then fixing it in retrospect on Day N+3. If “going over the cliff” gives the White House leverage to lock a better medium-term fiscal policy in place, then going over the cliff is a no brainer. Because there is no cliff.